The East Library along North Avenue, with the parking lot immediately north of the building. Wednesday night, Alderman Nik Kovac held a public meeting to allow feedback to be voiced regarding the three proposed alternatives for the redevelopment of the one-story East Library into a mixed-use facility. The meeting was a follow-up to a meeting last November discussing the potential of issuing a request-for-proposal (RFP) for the redevelopment of the East Library site. Attendees at the meeting were provided with an update on the process and allowed to ask questions about the process and proposals. In attendance were officials from the Milwaukee Public Libary, the City of Milwaukee Library board, the Department of City Development, and the Redevelopment Authority. Four public officials were in attendance listening and answering questions, Alderman Ashanti Hamilton (Library Board president), Alderman Nik Kovac (Library Board member), Alderwoman Milele Coggs (Library Board member), and Mayor Tom Barrett. As a background on the process, the Library Board has proposed transforming the way library services are delivered by introducing three different types of libraries, mixed-use facilities, area libraries, and express libraries designed to expand facility hours and modernize operations. Following the November meeting, a RFP was issued for redevelopment of the East Library located on North Avenue. Gorman and Company, HSI Properties, and Stone House Development all responded to the RFP, offering designs that those answering questions agreed were all fairly similar. Before the questions began, the officials gave a brief overview of the process to-date, highlighting that the mixed-use Villard Avenue Library will open October 5th 15th and that the Library Board may make a decision on which, if any, of the proposals to invite back for individual review on September 27th. Alderman Kovac explained to the audience that for final approval the redevelopment plan would need approved by the Library Board, the full Common Council, the Mayor, and likely the East Side/North Avenue Architectural Review Board (assuming it is approved prior to this project). A number of questions were asked of the officials in attendance. I have included summarized versions of many of the questions and answers below in an attempt to provide the most information about the project, but not to require one to read a word-by-word transcript of the meeting. The answers are not mine, but are paraphrased from the officials in the room. Is the land being sold? Yes, for $20,000 as well as the provision that a white-box, first-floor condominium be provided for the East Library in return. Who is the architect? 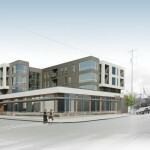 The developer will have their own architect for the exterior of the building, as well as their privately-owned areas. The Milwaukee Public Library will contract with an architect to design their space. Criteria for picking the best proposal? A number of things were mentioned including the size of the library condominium, parking, architectural design, compliance with design guidelines, prominence of library, articulated facades, green space, quality of materials, economic sustainability, and what the additional uses provide to the neighborhood. A comment was made that many new apartments are targeted towards “new urban professionals”. The commenter noted that she would love to live above the library and that the developments could be targeted to “old urban professionals” as well. Temporary library? The temporary library would need to be within walking distance and would likely be within a half-mile and not west of the Milwaukee River. Gorman was the only developer to propose a specific solution that involved a phased construction process with a temporary library on the north end of the lot similar to what is currently done in post-Katrina New Orleans. Free parking? Yes, the same number if not more stalls. One proposal has surface parking, two have underground parking. All have at least 40 stalls. These stalls are in addition to any parking necessary for residents of the proposed apartments. A comment was offered stating that the commenter was “not impressed” about the proposals. This drew applause from the audience. The commenter offered up that the designs looked too much like other new apartments in the area. This was repeated a few times. The Urban Ecology Center is financing a new location through donations, could the library do the same? No, estimates have new single-story, 20,000 square-feet library costing $11.7 million to build. There are significant cost savings through building a mixed-use library, including the financial relief provided by the property taxes from the rest of the development. 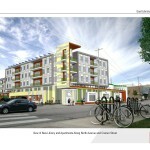 Alderman Nik Kovac noted that it has been shown that density on North Ave. is in demand. Are we stuck with the designs presented? Can developer cheapen designs during construction? Alderman Kovac answered that no, we are not stuck with the designs as is, and that no the developers can not cheapen the designs during construction. At this point Mayor Barrett jumped in to note that we need to collectively decide if the designs meet our expectations, and that he, as well as others, expected more applicants. In the only explicit endorsement of the night, one commenter stated they liked the HSI proposal the most, but merely because it was the one they disliked the least. Historic Preservation Commissioner Sandra McSweeney asked about what happens if financing from WHEDA falls through for the selected developer (provided it was one of the two seeking low-income housing tax credits – Gorman, Stone House), noting that being awarded WHEDA financing is not always dependable (likely intended, in particular, as a reference to the failure of the Mercy Housing proposal to be awarded credits). Alderman Kovac remarked that similar to what happened at Garden Park, it would likely kill the project and require it to be restarted. Is the condition of the library causing this? Not yet, but that at least one million dollars in maintenance would be required soon. Both Alderman Kovac and Mayor Barrett encouraged those in attendance to visit Villard Avenue Library. Is a TIF available for the site? Alderman Kovac said that it was definitively not. Ownership structure? The library would be in a condo owned by the Milwaukee Public Library, and that the library would hold a 50% share of the condo association. Only one question was about height (compared to 5 at the first meeting). Alderman Kovac noted that all of the proposals were below the zoning height limit of 60 feet. Blair Williams, part of the HSI Properties proposal and the only developer publicly in the room, noted that as it is in Milwaukee, density is driven by parking and the site is only so large (and underground parking is prohibitively expense below one floor). Answering to Alderman Hamilton’s question of him on design, Williams discussed that land costs are actually $1.5 million when the costs of the library condominium are considered. To those asking for an iconic building (a term that came up over and over), the cost of the building can’t exceed the revenue it generates. He noted that various forms of tax credits could help, similar to what was achieved when he developed The Cornerstone in Shorewood. Williams also noted the struggles from the timeline of the RFP, which resulted in a rendering that only reflects the massing and layout of the building, and not the end design. Tax revenue? Earlier in the questioning, Williams had also jumped in to a question about the tax revenue from the site. Noting, contrary to what the officials estimated, the construction cost of the site would exceed the assessed value of the site, and therefore the tax revenue from the site would likely be in the ballpark of $200,000/year. It will be interesting to see what the outcome is given the feedback offered tonight. The pulse of the room didn’t seem warm to the designs, but it also didn’t appear overall hostile to the idea. Would those in attendance be happy with any design short of the quality of City Hall or the Central Library (two buildings that Alderman Kovac noted no RFP could cause to be built today in Milwaukee)? Is using the design as the central point of disagreement merely a way of attempting to reject the project as a whole? The panel of five (Alderwoman Coggs, Vanessa Koster of DCD, Jim Plaisted of the East Side BID, Library Director Paula Kiely, area resident and Legacy Redevelopment Corporation founder Sally Peltz, and UWM SARUP Dean Robert Greenstreet, Ph.D) that is tasked with selecting which proposals to move forward has their work cut out for them. If all three of the proposals are ultimately rejected and another RFP is issued, it would be interesting to see if the design quality improves with a longer window to respond and a reduction in the parking requirements for the library portion of the project from 40 stalls to 20. Which proposal do you like? Vote in our latest poll in the sidebar. In addition there is an official form to offer your feedback in. Corrections – Alderman Kovac thankfully corrected two factual errors in my reporting. 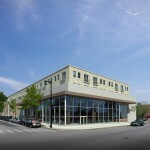 One, the Villard Avenue Library opens October 15th. Still please go visit. Two, Alderwoman Milele Coggs is not on the selection committee, but UWM School of Architecture and Urban Planning Dean Robert Greenstreet, Ph.D is. I was glad that only one person brought up the height issue last night, that concern always irks me, but I can see where that point of view is coming from. I was also pleasantly surprised by how united everyone was in their concern over the designs. In this case, I think that the residents have every right, and ought to be, concerned about how this building will look. Blair gave a great perspective from the developer’s side, and advised that the reality is that they only have so much money to work with, which makes it challenging when considering materials. I do hope, however, that the board is serious about their “requirement” that the building be “iconic” (which can be open to interpretation). I hope it’s not a “well, looks like that’s as good as it’s gonna get, so let’s just do it” kind of thing. Bob Greenstreet should be able to provide some good insight. Personally, I would like to see as much masonry as possible, but I understand that that really drives up the cost, as Blair was sure to point out. Whatever happens, my biggest concern was the same that was echoed many times–I don’t want it to be as uninspiring as buildings like Latitude apartments, it has to have enough unique elements that make it still interesting 50 years from now. I like the stone house design a lot. I wish they could build it higher though. Maybe 25 stories up. That would be very urban. I provided some written comments on the forms available inside the East Library. First, I suggested that they reduce the parking space requirements. Simply put, this is a walkable urban neighborhood, and therefore less parking is required because many of the people living in the apartments could live car-free. Less parking spots would mean more space for revenue-generating apartments and/or more space for the library. Second, I suggested more studio apartments. The average household size of this neighborhood (53202 zip code) is 1.41. Therefore, 1 bedroom apartments could be included of course, but there should be many studio apartments also included. Smaller size apartments are more affordable and likely could be a great place for car-free people to be able to afford to live. Smaller apartments would mean more, affordable apartments. Third, I suggested the design must be urban in character, not suburban. The building needs to meet the street in a wall, much as the buildings on North Farwell Avenue by the Oriental Theater. A small side park or green-space with benches is fine, but please no suburban-looking expanses of useless lawn. @John Agreed… Though I wonder if the better reduction in parking is in the 40 spots the library requires. Make that 20 to reduce the cost of the condo and use that money to make it a better building.